The Terrick Terrick National Park (TTNP) is home to many threatened species, the granite peaks of TTNP contrast with areas of remnant native grasslands. This is an ideal park for a scenic drive, bushwalk, push bike ride or picnic. Terrick Terrick National Park is 225km north-west of Melbourne and only 20kms from Pyramid Hill. Camping is permitted only at Mount Terrick Terrick near the Picnic area to protect the park’s fragile vegetation. 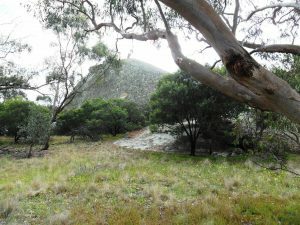 The park provides a basic bush-camping experience. Campers are advised to bring their own water, as well as a gas stove for cooking. Please notify the Ranger at Echuca of your camping stay, by calling 13 19 63.